It was made apparent to me in my high school days that a career in chemistry was far beyond my reach. I’m thankful I had that epiphany before any real damage was done to the school or my classmates. Yet I’ve always been fascinated by the folks that understand the functioning of the elements. This week, John Bell and Tracy Adams, two of MoDOT’s senior chemists were hard at work, coaxing chemicals to provide answers we need to build the best possible transportation system. John worked on an emulsion distillation. Yes. John has a still…at work. 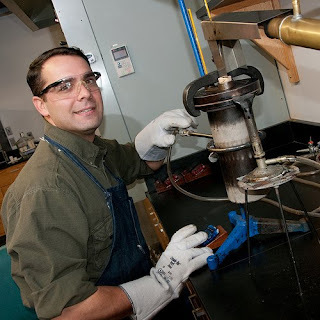 Only this still removes water from an asphalt emulsion so he can test the properties of the asphalt residue that remains. It’s got to meet stringent requirements to be accepted for use in road building and maintenance. By the way, he does not recommend drinking the results of the distillation. Ewww. 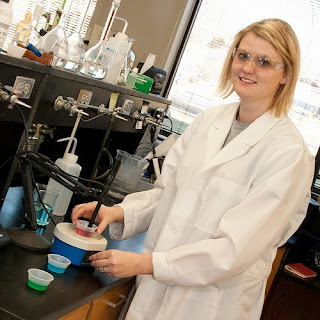 Tracy used three solutions to calibrate the pH meter before testing rock samples submitted as potential backfill material on an upcoming project. Her testing would reveal whether the acidity/basic level of the minerals in the rock will interact well with all of the other materials used on the project. Yes, road building needs to be that scientific – if you want highways, runways and other structures to last. It’s always interesting to peek around the corner and see who does what at MoDOT. What wonder will we find next? Check back to find out!